This is one in a series of food photo diary posts in which I track my food in pictures. I’m also counting my calories. Read all about it in this post or click here to view a detailed breakdown of my calorie intake in a nifty spreadsheet. I’ve been keeping track of my calories for a while now, but it doesn’t seem like the numbers quite correlate with my progress. Overall, the numbers tell me I’m burning more calories than I’m consuming, however I’m not losing weight (a good thing, because the whole point of this was to gain weight), but I can’t help but feeling like I’m missing something here. I’m certainly not going hungry. Take yesterday, for example. The diary shows me having consumed 1,234 calories. That’s absurd. So what am I missing? These strange numeric anomolies add to my existing uncertainty about the purpose of calorie counting. A lot of this comes from consistency, something I struggle with, especially when it comes to eating out. Although I only eat out a couple times a week, when I do, these Calorie injections, riddled with beer and wine and usually delicious (and rich) food, rarely make it into the diary. 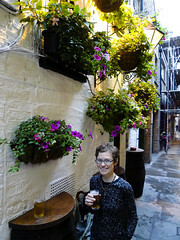 (As the photo above demonstrates, I’m usually too busy enjoying my beer to think about my silly spreadsheet – no laptops at the pub!) Could it be that my regular calorie deficits are balanced by these once- or twice-weekly social outings? I don’t know. So what’s the whole point of this if I’m not being consistent? I’m not sure. The number crunching is teaching me a few things about the foods I eat and how much protein I’m getting. I also like that I’m building up a collection of healthy, low-cal meals that other people might benefit from. But I wonder if I’m really getting out of it what I put in. 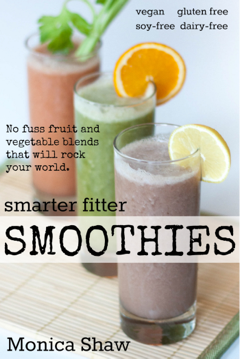 Is this really the way to getting stronger, faster, smarter and fitter? 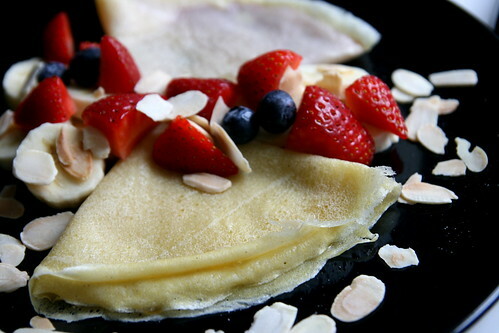 Two cornmeal crepes filled with orange marmalade, then topped with strawberries, bananas, blueberries and toasted almonds. Served with tea and soymilk. One slice of homemade french bread, 1/4 avocado, chickpea salad, leftover stir-fried mushrooms, and fresh leaves and veggies dressed with olive oil and balsamic vinegar. 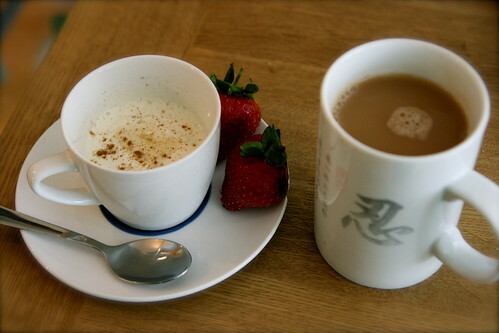 50g of plain Sojade soy yogurt with two strawberries and a cup of rooibos tea with soy milk. 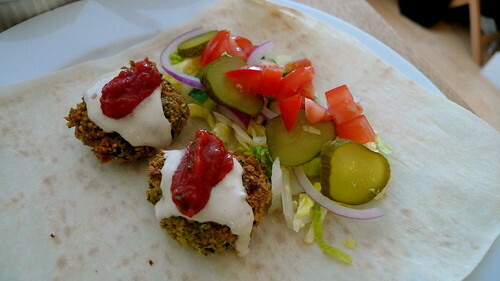 Two homemade falafels in a pita wrap with tahini sauce, hot tomato sauce, lots of salad, plus extra salad and tahini on the side. Hi! The vegan cornmeal crepes recipe sounds interesting! Is there any way you could send me the recipe? 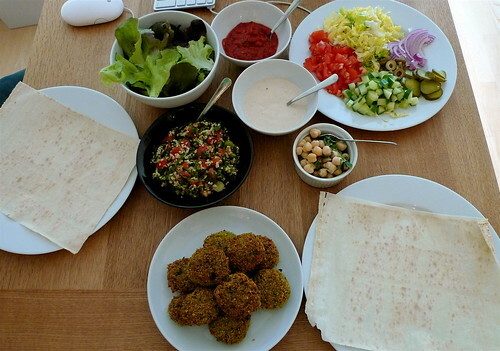 Those homemade falafels sound incredible! Do you put cilantro in yours? Great article. I often see people buying foods based on calorie count when they have no idea what is actually in the food. Those foods look Delicious! Mmm crepes. I think that our bodies react differently- some people require a lot more calories, others don’t burn quite so many, and then there’s always the possibility that the calorie counts are off by a little bit, too. So many factors! I know for myself I don’t really think in terms of calories though. I just think in food exchanges. Katharina – recipes are on their way. I use parsley in my falafel but I do want to try cilantro. The recipe I use is http://bitten.blogs.nytimes.com/2008/02/12/recipe-of-the-day-falafel/“ rel=”nofollow”>Mark Bittman’s Falafel and he suggests cilantro, as well. As for the deficit, you’re right about the veggie/vegan thing. 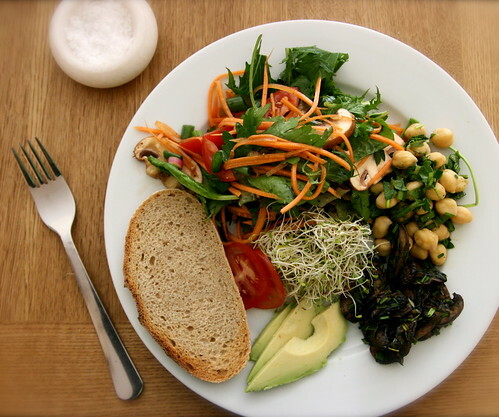 I’ve been trying to add more good fat to add “oomph” (avocado, nuts and seeds mainly), plus more beans and complex carbs like brown rice, quinoa, and other whole grains. At the end of the day, I probably just need to eat more of everything. I probably shouldn’t complain! @PT – Thanks for the compliment! Yeah, I buy food based on taste and quality first, then look at the calories. Food is meant to be enjoyed, first and and foremost! @Sagan – You’re so right about different bodies / different calories. I also notice that on different days, my body just seems to need more food than others. Some days I’ll have no appetite at all (ok, those days are rare), while on others, it’s like I’m constantly hungry. The body is a fascinating mystery!